Daria has shared her review of Zep Hardwood and Laminate Floor Cleaner. I clean my hardwood floors twice a month. I first remove debris from the floors with the soft brush attachment of my vacuum cleaner and then finish the process with a microfiber swivel mop lightly coated with Zep Commercial Hardwood & Laminate Floor Cleaner. 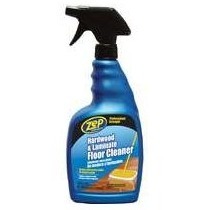 I have used other Zep products in the past so when I saw their wood floor cleaner I had to try it. The Professional Strength formula is definitely a winner for its reasonable price and unbeatable performance. The product states it's for use to clean and restore shine without streaking. I can attest that the Zep cleaner lived up to its claims. I am not a fan of high gloss finishes in hardwood floors so I'm thrilled with the natural clear shine that is left after cleaning with Zep. The cleaner comes in a handy spray bottle that can be used to apply an even mist directly to the floor or to the surface of a mop. I use a microfiber swivel mop lightly coated with Zep to clean and enhance the natural beauty of my hardwood floors. There is absolutely no sticky residue or streaks after use and Zep has a clean, soapy scent that gently lingers after mopping. This product is a must for people who like a natural sheen to their hardwoods and detest the strong odor of oranges that many other floor cleaners leave behind. Thanks Daria for sharing your Zep Hardwood and Laminate Floor Cleaner review. Has anyone else used this product? If so, I would love to hear what you think about it, and how it has worked for you. You can share your hardwood floor cleaners review here, for this, or any other brand, telling me what you like, or dislike, about it and why. In addition, you can read other reviews that have already been submitted. In addition, I know Zep makes a lot of other types of cleaners too. If you have used any other Zep cleaners, please share your reviews here.